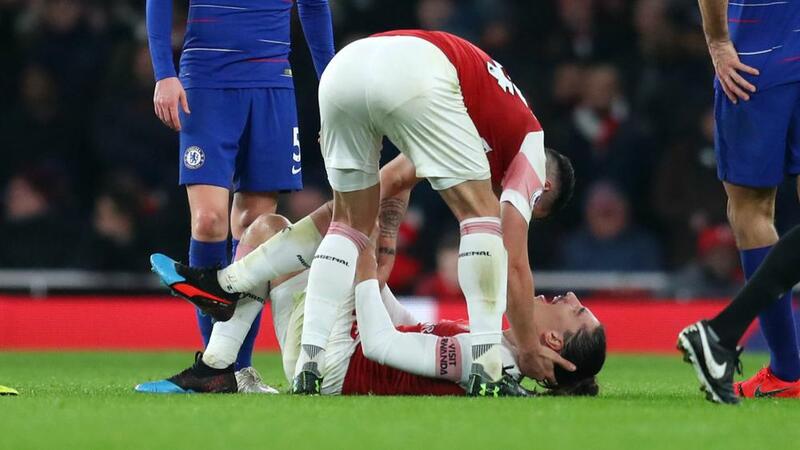 Laurent Koscielny says Arsenal team-mate Hector Bellerin should try to "enjoy life" during his injury lay-off and has backed the Spaniard to return "stronger than before". Gunners right-back Bellerin has been ruled out for the rest of the 2018-19 season after rupturing the anterior cruciate ligament (ACL) in his left knee in a Premier League win against Chelsea on Saturday. Bellerin was making his first start since recovering from a calf strain sustained in December, but he could now be out of action for as long as nine months. Koscielny, though, feels his fellow Arsenal defender can use the opportunity to explore opportunities away from the pitch before making his comeback. "Like I said to him yesterday, 'Put football on the side and enjoy a bit of your life with your family and friends'," Koscielny told Sky Sports. "He is starting a new chapter of his career. "He knows all the team are here to help him because we know he will have some difficult moments during his rehab, like Rob [Holding] and Danny [Welbeck], but they know all the team are here and behind them to help them come back with us and help us to have results together." Koscielny is no stranger to the treatment room himself, with the 33-year-old having only recently returned to action after rupturing his Achilles. "It was very hard during some moments because I missed the World Cup," said the France defender. "But you learn a lot about life, you are more positive about football because you know it's just a small part of your life, and you have some good things off the pitch. "I discovered a lot about life so I was surprised about that. I was very focused on my rehab so sometimes you are in a bubble and you can't see people trying to help you to be back as soon as possible. "When you are a football player you are focused on football, media, results and you forget a lot of things around you. You can forget family and kids a bit because you are with your team-mates all the time. It's important to open your eyes and enjoy life as well as your football career.